Wheat germ is the embryo from a wheat kernel. Oil produced from wheat germ is high in vitamins E, D, and A. It contains reasonable amounts of carotenoids [bioactive pigments] that are important for skin health, particularly lutein. Additionally, wheat germ oil contains large amounts of fatty acids such as linoleic, oleic, and palmitic acids. The compounds in wheat germ provide anti-oxidant protection. They are able to scavenge free radicals from UV light and ozone that harm the skin. Together, they hydrate and moisturize the skin, protect against sun damage, increase skin elasticity, and reduce inflammation. Wheat germ is the embryo of a wheat kernel . It comprises only 3% the weight of the wheat grain, but contains 25% of the protein, vitamins, and minerals in the grain . Oil extracted from wheat germ is a natural, stable preservative, making it a good carrier oil. Preparations using wheat germ oil are easily spreadable and stable . It contains many important bioactive compounds. Wheat germ oil is rich in vitamins A, D, and E. It is also rich in proteins. It has high amounts of fatty acids, particularly linoleic, palmitic, and oleic acids . Oils rich in fatty acids prevent loss of moisture . Carotenoids, organic plant pigments, are also present in high amounts in wheat germ oil . Several types of carotenoids, such as β-carotene and α- carotene, are precursors to vitamin A. The primary carotenoid in wheat germ is lutein, which is important for skin health [7­]. Carotenoids and vitamin E cannot be made by the body and must be supplemented. Wheat germ oil has high anti-oxidant ability . It is able to scavenge harmful free radicals that cause damage to the skin . The anti-oxidant ability of wheat germ oil is associated with high levels of vitamin E, particularly the tocopherol form. Of vitamin E in wheat germ oil, 50% is the α-tocopherol form and 25% is the β-tocopherol form. Gamma and delta forms of tocopherol are absent . Vitamin E in the skin is rapidly degraded by UV exposure. This natural deficiency increases susceptibility to skin aging and photodamage, thus vitamin E supplementation is essential for protecting the skin. Vitamin E is also known to increase collagen synthesis and decrease collagen degradation. It protects against inflammation and sunburn . Topically applied carotenoids also show anti-oxidant activity and protect against UV skin damage . They increase the amount of surface lipids, waxy compounds necessary for retaining moisture and providing barrier function, and decrease lipid degradation. Lipid degradation is associated with UV damage. Topical treatment of carotenoids is effective in increasing skin elasticity and skin hydration . Wheat germ oil also contains reasonable amounts of squalene. Squalene is naturally found in sebum [oil] on the skin. It increases skin suppleness, restores barrier function in skin, and has anti-oxidant ability . Linoleic acid [omega-6], one of the most abundant polyunsaturated fatty acids [PUFAs] in wheat germ oil, is also the most abundant fatty acid in the skin. It helps treat acne, moisturizes, and heals sunburn . α-linolenic acid [omega-3], a major component of wheat germ oil, has anti-inflammatory activity . It is associated with lower free radical production. Oleic acid [omega-9], aids in wound healing, collagen stimulating, and is anti-oxidant and anti-inflammatory. Levels of palmitic acid, a saturated fatty acid, decrease with age and photodamage . Supplementation of palmitic acid in the form of wheat germ oil may help prevent skin aging and sun damage. Wheat germ oil supports skin regeneration and treats dry, cracked skin . It helps diminish the appearance of stretch marks and scars . It nourishes and softens the skin. Creams containing wheat germ oil increased skin hydration and decreased wrinkles after three weeks of application . 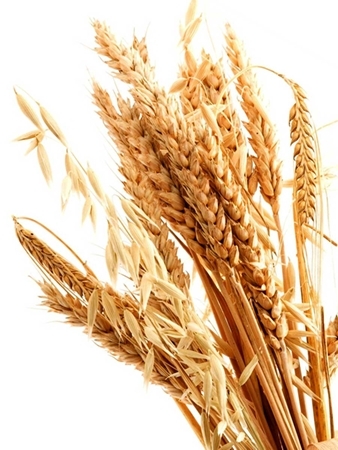 When applied to the skin, wheat germ oil increases circulation and heals skin damaged by the sun . It reduces skin irritation and inflammation . Wheat Germ oil should not be used by those with wheat or gluten allergies, either externally or internally. Usage: Wheat germ oil should not be heated. C. Alessandri, P. Pignatelli, L. Loffredo, L. Lenti, M. Del Ben, R. Carnevale, A. Perrone, D. Ferro, F. Angelico, and F. Violi, “Alpha-Linolenic Acid–Rich Wheat Germ Oil Decreases Oxidative Stress and CD40 Ligand in Patients With Mild Hypercholesterolemia,” Arteriosclerosis, Thrombosis, and Vascular Biology., vol. 26, pp. 2577-2578, 2006. A. Brandolini and A. Hidalgo, “Wheat germ: not only a by-product,” Int J Food Sci Nutr., vol. 63, suppl. 1, pp. 71-74, March 2012. [3. P.W.R. Eggitt and L.D. Ward, “The Chemical Estimation of Vitamin-E Activity in Cereal Products,” J. Sci. Food Agric., pp. 569-579, vol. 4, December 1953. E.J. Kim, M.K. Kim, X.J. Jin, J.H. Oh, J.E. Kim, and J.H. Chung, “Skin Aging and Photoaging Alter Fatty Acids Composition, Including 11,14,17-eicosatrienoic Acid, in the Epidermis of Human Skin,” J Korean Med Sci., vol. 25, issue 6, pp. 980-983, June 2010. G.S. Kumar and A.G.G. Krishna, “Studies on the nutraceuticals composition of wheat derived oils wheat bran oil and wheat germ oil,” Journal of Food and Science Technology, vol. 52, issue 2, pp. 1145-1151, February 2015. P. Kumar, R.K. Yadava, B. Gollen, S. Kumar, R.K. Verma, and S. Yadav, “Nutritional Contents and Medicinal Properties of Wheat: A Review,” Life Sciences and Medicine Research, pp. 1-10, 2011. P. Palombo, G. Fabrizi, V. Ruocco, E. Ruocco, J. Fluhr, R. Roberts, and P. Morgant, “Beneficial Long-Term Effects of Combined Oral/Topical Antioxidant Treatment with the Carotenoids Lutein and Zeaxanthin on Human Skin: A Double-Blind, Placebo-Controlled Study,” Skin Pharmacol Physiol, vol. 20, pp. 199-210, 2007. S. Saraf, S. Sahu, C.D. Kaur, and S. Saraf, “Comparative measurement of hydration effects of herbal moisturizers,” Pharmacognosy Res., vol. 2, issue 3, pp. 146-151, May 2010. N.K. Thakur, P. Bharti, S. Mahant, and R. Rao, “Formulation and Characterization of Benzoyl Peroxide Gellified Emulsions,” Sci Pharm, vol 80, issue 4, pp. 1045-1060, December 2012. J.J. Thiele, S.N. Hsieh, and S. Ekanayake-Mudiyanselage, “Vitamin E: Critical Review of Its Current Use in Cosmetic and Clinical Dermatology,” Dermatol Surg,vol. 31, pp. 805-813, 2005. Y. S. Velioglu, G. Mazza, L. Gao, and B. D. Oomah, “Antioxidant Activity and Total Phenolics in Selected Fruits, Vegetables, and Grain Products,” J. Agric. Food Chem., vol. 46, issue 10, pp 4113–4117, 1998. I. Vermaak, G.P.P. Kamatou, B. Komane-Mofokeng, A.M. Viljoen, and K. Beckett, “African seed oils of commercial importance — Cosmetic applications,” South African Journal of Botany, vol. 77, pp. 920-933, 2011.